Our Network We CAN Control Corrosion in India scored Double Century Last Year. We would like to invite the New Year 2012 with Triple Century. We invite you to fetch us 11 more members to complete this record (two more golden days are there) and strengthen our collaboration. Role Summary/Purpose As a Materials Scientist, you will conduct basic and applied research in the area of corrosion and electrochemistry. You will be shaping the technical vision for the corrosion laboratory teaming with fellow scientists. You will be designing careful experiments to understand and mitigate several modes of corrosion in materials, analyzing data, and sharing results it in a global team set-up. You will also interact with characterization experts to interpret materials behavior post-experiments. •Metallurgical engineer with experience in performing a wide range of materials engineering services including materials, corrosion, welding, coatings, insulation, cathodic protection etc. The company has since halted the flow of oil from all export lines linking the FPSO to the tanker and estimates the amount of leaked oil at less than 40,000 barrels. “Another significant development is that this afternoon we identified the source of the leak as a failure in a flexible export line. Let me express my heartfelt thanks to industry colleagues and government agencies for their ongoing support to mitigate the impact of the leak." KANNUR: The city is reeling under acute water shortage. In the last three days, water supply was disrupted in many parts of the city. But now with the new project being planned to renovate the existing water supply network in the city, it seems the authorities are slowly waking up to address the issue. Minister for water resources P J Joseph will inaugurate the Rs 67 crore project on October 1. A new 35-km-long pipeline would be installed parallel to the existing one from Pazhassi dam at Veliyambra to the Thana tank in the city. This is expected to solve the issue of frequent water supply disruptions in the city and the surrounding areas. Pipelines in the area are built using 700 mm asbestos cement pipes and hence pipe burst is a persistent issue. Under the new project, these pipelines will be replaced with ductile iron pipes. THIRUVANANTHAPURAM: The city faced severe water shortage on Monday after a major pipe-line bringing in water from Aruvikkara burst on Sunday night. This is the fourth major pipe-burst in the city in the last twenty-four hours. The last burst occurred on the Pipeline road near the Sasthamkode temple at Vazayila. The concrete pipeline here burst around 10.30pm on Saturday causing serious damage to two nearby houses. The compound wall of the two houses also came down due to the forceful gush of the water. One person was also injured. The water also jetted into other houses causing minor damages. Long queues of tanker lorries were seen along various residential lanes often resulting in mild squabbles. Many hotels in the city were forced to serve food in parcels because of the water shortage. CNOOC Limited announced, its subsidiary Zhuhai Hengqin gas processing terminal (“Zhuhai Terminal”) today received notification from Zhuhai Maritime Safety Administration (“Zhuhai MSA”) that a leakage was found in the nearby subsea gas pipeline of the Zhuhai Terminal. After the incident occurred, CNOOC Limited Shenzhen Branch immediately launched the subsea pipeline leakage emergency plan and shut down the production of relevant platforms of PY30-1 and HZ21-1 fields. Currently the terminal is under accelerated depressurization process. This incident neither caused any injuries nor environmental pollution, and the situation is under control. Due to this incident the Company's net production will be affected by approximately 160 mcf per day (around 26,700 boe per day). Development of the Deen Dayal West field (DDW) off eastern India remains on schedule to deliver first gas in 2013, according to partner Jubilant Energy. The wellhead platform was installed offshore this May and the jackup Deep Sea Driller–1 started drilling of four development wells in September. It will batch drill the tophole sections of the four wells before being replaced by a more economical modular rig early next year. At the end of November, the wells were drilled to the following depths: DDW-D1- 2,616 m (8,582 ft) MD; DDW-D2- 2,806 m (9,206 ft) MD; DDW-D3- 2,464 m (8,084 ft) MD; and DDW-D4- 83 m (272 ft) MD. Post-spud fabrication of the platform continues at the contractor Larsen & Toubro’s (L&T) yard. The company's board has approved the integrated development of the B-127 cluster, along with the additional development of the B-55 field. The B-127 cluster comprises three marginal fields: B-127, B-157 and B-59, and is located east of the Mumbai High field, with significant hydrocarbon accumulations in multi-layered reservoirs within the Bassein and Panna formations. ONGC has in-place hydrocarbons of 24.6 million tonnes of oil and oil equivalent gas, of which 15.35 million tonnes in major pools is being considered for development. The B-127 cluster development has an estimated cumulative production of 1.836 billion tonnes of oil and 2.093 billion cubic metres of gas over a ten-year period. New Delhi : The Municipal Corporation of Delhi (MCD) has warned that water being supplied by Delhi Jal Board (DJB) is being contaminated with sewer waste, which is endangering the lives of millions of people in the capital. MCD has also claimed that even though it has identifed about 950 water pipelines in Delhi passing through drains this year, DJB has only managed to repair 11. The municipal agency said majority of population in the city was receiving potentially hazardous water and half of Delhi lacks properly treated drinking water. MCD's Medical Relief and Public Health Committee chairman VK Monga said, “Despite our repeated request the Delhi Jal Board has failed to take any action in checking supply of contaminated water. The impurities in the water supply are a mixing of sewer water with drinking water at several places. Consuming such water can cause health hazards such as gastrological diseases, typhoid, cholera and jaundice". "We have been informing DJB about these faulty pipelines at regular intervals. The pipelines have corroded and sewer water is getting mixed with fresh drinking water. But in the last six months, they have done little to improve the condition of these pipelines. Of the 942 pipelines, which pass through drains, only 10 have been repaired so far. Residents of Delhi are forced to drink contaminated water", he added. India - Corrosion Prediction - How do we relate the Prediction of Corrosion using computer models to the reliability of materials selected for a new design? When a new design is attempted we come across many instances of proven and unproven experience on the performance of materials. If the reliability of materials is unproven, exploring their use in a process environment is risky. Can we rely on Corrosion Prediction using computer models to convert the Unproven experience into a meaningful design? Various functions involved in the functional analysis of corrosion management are: Predict-Design-Apply-Monitor-Control-Assess. Reliability and effectiveness of this functional analysis is centered on the flow of information from one component to another and the quality of data it takes in for various processes. Any broken link or avoidance of any component leads to “Uncertainties” that reduce confidence levels of finding “Optimal” solutions to corrosion problems. Prediction needs to be done to carry out any functional analysis. Our “Own Experience” is a good starter followed by using the appropriate software models available for industry specific applications (Truth: Significant development is noticed for Energy sector only) and gathering experience from similar plants and systems. Technology providers with specific skills in Prediction form a systematic approach of identifying the design requirements and providing integrated solutions. Cairn Lanka Limited, a wholly owned subsidiary of Cairn India Limited, has notified the appropriate authorities in the Government of Sri Lanka of a Gas Discovery in the CLPL-Barracuda-1G/1 well, located in the block SL 2007-01-001, Mannar Basin, Sri Lanka. This is the second well in a three well frontier basin program. Cairn Lanka Private Limited is the operator and has a 100% participating interest in the block. The CLPL-Barracuda-1G/1 well is the second successive discovery, located 38 kilometers (km) west of the CLPL-Dorado-91H/1z discovery well and approximately 68 km from the Sri Lanka coastline. An update on the well results will be provided after the end of the program, which is expected to be complete by early next year. "We CAN Control Corrosion in India" an Open Source Knowledge Management Networking initiative was launched on 14 Dec 2009 to identify a suitable "Iron Pillar Way" controlling corrosion in India. India - Corrosion Effects - What is the limit of chloride in recirculating water having copper metallurgy? What is the limit of chloride in recirculating water having copper metallurgy? How does chloride attack on Copper and what is the limit we should maintain? Give some reference also. India - Corrosion of Concrete Structure - How do we view Corrosion problem? Is it for Industries only? How do we view Corrosion problem? Is it for Industries only? Background: My collegemate from Mechanical discipline approached our alumni network to resolve his domestic concrete corrosion issues. Problem: How to counter the problem of corrosion in the reinforcement rods of roof/ceiling concrete? The layer of concrete beneath the reinforcement rods in concrete roof, has got bulged and I am planning to repair it, by removing the loose material, and do replastering. 3 years back, I removed the complete weathering layer over the roof (including brick chips and sintered / country tiles) and re laid it, suspecting the weathering layer, after seeing the dampness in few areas, at the bottom of the ceiling. However, it seems that the mason has not done a perfect job. Could you suggest any method of applying some protective coating on the corroded reinforcement rod, after removing the loose layer and before taking up the re-plastering. I was told that once corrosion sets-in in the reinforcement rods, it can't be prevented totally. Action: On our recommendations he approached some suppliers in the market who manufacture chemicals for rehabilitation of corroded concrete structure. He couldn't get the right info. His experience: The manufacturers loose interest the moment I say it is for repairing a small patch of roof concrete, in an individual house. Probabaly they may be interested if the quantity involved is high. We have lot of requirements for Technology & Technical Services Candidates for Protective & Marine Coatings regulary. Now urgently we need People for Quality / Production & R & D. near Mumbai. While you are not getting any of the above contact no please mail me you will get immediate response. The Senate unanimously approved a pipeline safety bill Monday that stemmed from a spate of incidents, including last year's deadly explosion in San Bruno that killed eight people and destroyed 38 homes. The measure had been held up by Sen. Rand Paul (R-Ky.), who lifted his hold after reaching agreement with Democrats to add a key recommendation from the National Transportation Safety Board. Is it good to rely on setpoint for corrosion control based on Industry Standard or our own operational experience? What should be the best possible way to establish a meaningful setpoint relationship for corrosion control? There are instances of defining setpoints like 2 mpy for the coupons installed at the return line of cooling water for characterizing the whole treatment and less than 1 mpy for terming the observed general corrosion rate as "Low" for process circuits based on Industry Practice/International Standard. These setpoints do not always reflect current design criteria including the changes made in original design for future operation. What should be the appropriate relational grading technique from the standpoint of: 1.Asset Owner, 2.Corrosion Control Service Providers (CSP), 3.Process Designer, 4.Corrosion Management Consultants/Auditors and 5.Corrosion Researchers to accommodate "uncertainties" arise during the regular operation? 700 million litres of water per day is lost due to leakages along the 400 km of ageing pipeline network or by way of illegal connections in Mumbai. Of the 3,400 million litres of water supplied to the city every day, a whopping 700 million litres is unaccounted for. This means that it is either lost due to leakages along the 400-km of ageing pipeline network or by way of illegal connections. In an effort to curtail leakages along water pipelines that lead to a loss of about 20 per cent of the total water supplied to the city, the BMC is mulling the option of outsourcing the work. Despite numerous efforts in the past to curb leakages either by forming a ‘leak detection squad’ or by planning to procure modern leak detection equipment, senior civic officials now feel they should appoint private firms to plug leakages. Our Observation: Is there any effort made to identify the cause of leakage? Corrosion of water pipeline is one of the prime causes for huge loss in water and also affects the quality of water supplied to the public. It is highly advisable to have a corrosion research study for the quality of water and pipeline material chosen for distribution system. Industry academia linkages or the lack of it has long been a topic of discussion. India is expected to be one of the leading nations in innovation economy. The universities will have to play a greater role in R&D and innovation strategy of industry, besides being the cradle of skill creation and development. 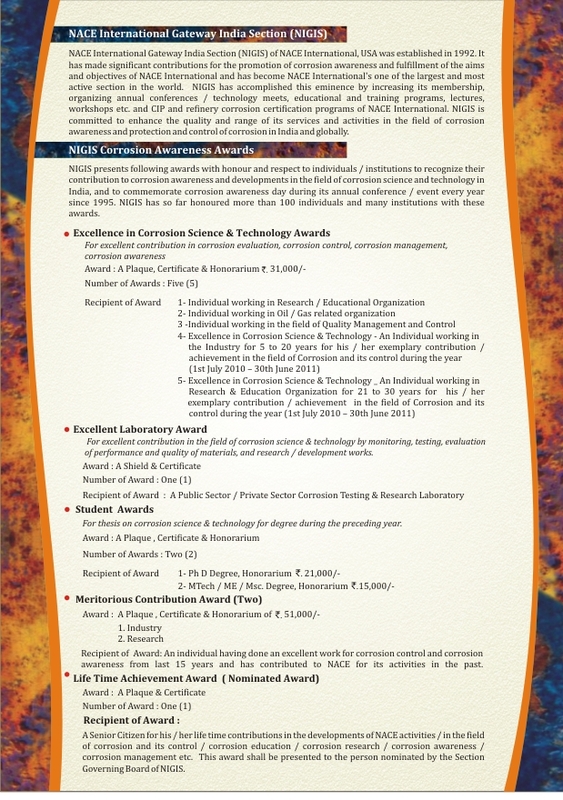 We are pleased to inform you that FICCI in partnership with Department of Science and Technology (DST), Govt. of India is organizing a two-day conference and exhibition India R&D 2011 with the theme - “Industry-Academia linkages” on November 2-3, 2011 at India Habitat Centre, New Delhi. The objective of the conference is to bring industry and academia together to define research priorities. The conference will also delve on ways of creating adequate IP ecosystem and share learning’s from the MNC experience, which have been instrumental in animating the aforesaid linkages in India. Conference brochure along with Registration Form may be downloaded from http://www.indiarnd.com/. We are happy to invite you for this programme. May I, request you to kindly send your registration form with complete details & the requisite fee to Mr. Gaurav Gaur, Asst. Director, FICCI, or confirm at gaurav.gaur@ficci.com. Please feel free to contact us for any further information/clarification. Look forward to your kind confirmation. India - Corrosion Research - How to conduct a research study for an industrial problem? What approach should we follow - qualitative or quantitative or mixed- for translating industrial experience into a research problem? Our network would like to learn from your experience for the methods, types and workflow involved in conducting suitable research studies for addressing the industrial problems. Cairn Lanka, a wholly owned subsidiary of Cairn India, has discovered natural gas with its CLPL-Dorado-91H/1z well offshore Sri Lanka. Situated in waters measuring 1,354 meters deep, the discovery well was drilled on Block SL 2007-01-001, in the Mannar Basin offshore Sri Lanka. Cairn contracted the Chikyu drillship to drill the exploration well. The National Transportation Safety Board released its full report into the investigation of the deadly PG&E gas line explosion in San Bruno that killed eight people, injured several others and destroyed several homes. Meridium is looking for a seasoned inspection engineer to join our team as a consultant. Meridium is looking for a seasoned inspection engineer to join our team as a consultant. This position will working as a consultant in the field of Inspection and Corrosion management especially for the oil and gas industry. You will be responsible for identifying and evaluation customer solutions with Meridium’s products relating to inspection and corrosion management. Remuneration will include local & international travel, and consulting with similar industries. This position requires candidates to have a dynamic personality and a desire to lead a team. The selected candidate will be trained on Meridium products. Northern Offshore, through its subsidiary, Jet Drilling, received a Letter of Award from Oil and Natural Gas Corporation Limited (ONGC) for its semisubmersible Energy Driller for work offshore India. The term of the contract is for three years with initial operations commencing off the west coast during the first quarter of 2012. The Energy Driller completed its previous three-year contract with ONGC on August 31, 2011 and was subsequently demobilized to a Singapore shipyard arriving September 20, 2011. While in the shipyard, the rig will undergo Class inspections and maintenance in preparation for the new contract. The estimated contract value for the award is approximately US$230 million. SERIOUS structural problems in Melbourne's City Loop - including cracking tunnel walls, concrete corrosion and poor emergency systems - have been ignored by successive state governments and train operators despite repeated warnings. The Metro Rail tunnels in Kolkata, which lack the presence of surface protection systems in most of its areas inside the tunnels, have already undergone repairs. Article Source: NBMCW December 2008 issue. Continuous surface treatment on the interior surfaces can make underground structures waterproof and dry, which may not be achieved by injection or grouting. The surface treatment can be in the form of waterproofing plasters or in other forms. The surface treatment is provided after arresting water leakages at point leaks, construction joints, honeycomb areas and at structural discontinuities, as at locations of inserts. The provision of a waterproofing treatment on the interior surfaces of a concrete tunnel structure will thus prevent not only water leakages and the wash-out of the products of cement hydration and other components of concrete but also early corrosion in reinforcing bars. The treatment will consequently enhance the durability of tunnel structures of concrete. The waterproofing treatments, provided on selected areas of the Metro Rail tunnels in 1983 and later in other areas in 1995, remain effective till date as a testimony to the long term effectiveness and durability of the particular cement-based surface protection system for underground structures. The Indian standard IS 456:200015 recognizes the problem of early distress in concrete structures as well as the causes for such early distress when it states in its Clause 8, Durability of Concrete: "One of the main characteristics influencing the durability of concrete is its permeability to the ingress of water, oxygen, carbon dioxide, chloride, sulphate and other potentially deleterious substances." The interior surfaces of tunnels are generally exposed to air and thus these surfaces, if not protected, will permit the ingress of oxygen and carbon dioxide. While the diffusion of carbon dioxide may lead to depassivation of reinforcing bars, making corrosion in such bars possible, the diffusion of oxygen into the structures will lead to corrosion in the rebars in the presence of the moist environment inside the structure. Four industrial workers died after inhaling hydrogen sulphide gas that leaked from a chemical factory in Tarapur on Tuesday evening. The leak occurred at around 7.15 pm on the premises of SeQuent Scientific Ltd, at a plant that makes veterinary drugs, within the Maharashtra Industrial Development Corporation’s (MIDC’s) industrial zone at Boisar, Tarapur. KOCHI: Oil companies in Kochi have upped their surveillance to monitor the pipelines which pass underground through the city carrying highly inflammable oil products. India - Corrosion Management - How important is collaboration of service providers with the end-users for achieving corrosion control? Development of corrosion control technologies is achieved through the collaboration of academicians, researchers, service providers and end-users. When a control service provider (CSP) goes to Company A for solving A's problem, A should be comfortable in giving CSP the present conditions and experience with other systems. If the conditions are not properly presented, we can not demand the best control means from the CSPs. Lack of resources in terms of using makehift personnel to formulate, select and assess the control measures is the prime cause for failure of technologies applied in the field. Technologies suitable for site A may not hold good for site B. The success of technology is totally driven by the approach of site management. Manickam Valliappan • Mr William Sierra: This forum welcomes your interest in delivering the knowledge base to India. Are you looking for partners in India for this initiative? What sort of assistance you need from our region? US - Two Decades of Spills - Corrosion is identified as one of the chief reasons for spills. Corrosion (22%) is identified as one of the chief reasons for Two Decades of Spills in the US. Do you want to experience or control in India? Join our group to explore. Do we conduct corrosion research for the simulated industrial conditions/failures? What is the present status of these activities in India? There are two cases. 1. Development of new models/theories to solve future problems. 2. Utilisation of existing models to solve present day problems. If we keep on developing new theories without seeing the validity of existing models, the sufferers (industries) will be confused for the direction they have to follow. This confusion aids the makeshift personnel (corrosion issues handled by non-corrosion groups) to propose solutions with uncertainties. These uncertainties are the prime source for ineffective corrosion control. There will be an interlinking component for providing the best basis for case 1 development from case 2 observation. Do we conduct research for the simulated industrial conditions/failures? It is not the question of simply changing temperature or concentration of inhibitors or materials. The success of any research study for extending product life cycle totally depends on how effective we simulate the conditions, conduct the tests under a controlled atmosphere and interpret in a meaningful way to address application issues for a variety of industrial conditions. This simulation comes from the knowledgebase available within the industry/sector/country/globe. The strength of knowledgebase in handling the complex issues is geography specific development and depends on the personnel available within the setup. There is a huge gap between researchers and the practicing engineers; industries and academic institutions (students choosing corrosion discipline). This gap is evident from the utilisation of people who have got proper education in corrosion. A respondent of our survey has recorded the following observation for "Which of the following factors do you see for the present flaws/gaps in nationwide corrosion control efforts?" Others: Corruption, Least provisions in Tenders Knowingly, Lack of will power. Participate in our survey http://corrosionmanagementsurvey.in/ and share your observation with other respondents to assist our network in finding a suitable Iron Pillar Way of controlling corrosion in India. Others: Corrosion education is limited to theories. There is no practical education. Limited Special Packages are available for multiple delegate bookings and accommodations. For bookings and registrations, please email me at monica@oreteam.com and oreteam@oreteam.com. Manickam Valliappan • "The corrosivity of water is difficult to be defined using single parameter such as the corrosion rate". This statement is valid in a variety of situations. Many people have the misconception of looking at corrosion rate only for finding appropriate solutions. Ashwini K Sinha • Mostly corrosion rate is measured using coupons. Coupons give only cummulative effect after a defined period of time. This does not indicate the transients which are more important. Other things are water quality, microbiological/organic matter, operating conditions, extent of fouling/scaling, which affect the corrosion behaviour. As a matter of corrosion behaviour along with correlation with other factors should be monitored. Satendra Kumar • Its really a good move to do but for this as suggested by Mr Manickam and Sinha many factors will influence the corrosion rate. However, considering few important factors with respect to materials and corrosivity from the particular environment on materials using corrosion handbook, a rough calculation can be made using statistics. You can try it but will definately have to work a lot to collect data from the researchers. Objective: This workshop aims at creating awareness among the students, faculty members, scientists and industrialists about the Marine Corrosion problems and focuses on sharing the knowledge of the recent development in the corrosion prevention methods. NACE International Gateway India Section, Student Chapter in association with Dept. of Metallurgical Engg. and Mat. Science, IIT Bombay is organizing a Seminar on “Experimental Techniques for Corrosion Research” on 27 – 28 Sept 2011 at Seminar Hall, Vanvihar Guest House, IIT Bombay. Attached, please find the seminar brochure. Those desirous of attending the workshop have to register with the Seminar Convener. The last date for registration is 15th September 2011. The registration will however will be closed once the required participants register. Our Network Discussion: Can anybody suggest how to start in the field of corrosion as a fresher? Can anybody suggest how to start in the field of corrosion as a fresher?? I have Masters degree in corrosion engineering. I have over 34 years of experience in Corrosion & Control in Power plants which includes failure analysis due to corrosion, corrosion monitoring, corrosion analysis, coolling water treatment, design of cathodic protection, protective coatings, corrosion audit, acid dew point corrosion, chemical cleaning of heat exchangers, selection of corrosion resistant materials, efficiency improvements, etc. My experience also covers setting up of R&D centres, water recycling, etc. I am working presently with NTPC and am due to retire in July 2012. I am looking for consultancy assignments in Corrosion related areas, establishment of labs, waters & waste waters treatments, control of corrosion etc. If any body has any requirements related to this, please contact me at ashwiniksinha@gmail.com or +919650991195. Thanking you in advance. As a speciallization, I have done laboratory testing of Hign nitrogen stainless steels in acidic environements for a year as a part of final year thesis at IIT Roorkee. That includes electrochemical methods like potentiodynamic polarization, EIS (Electrochemical impedance spectroscopy) etc. Also I have knowledge of other ASTM test methods. 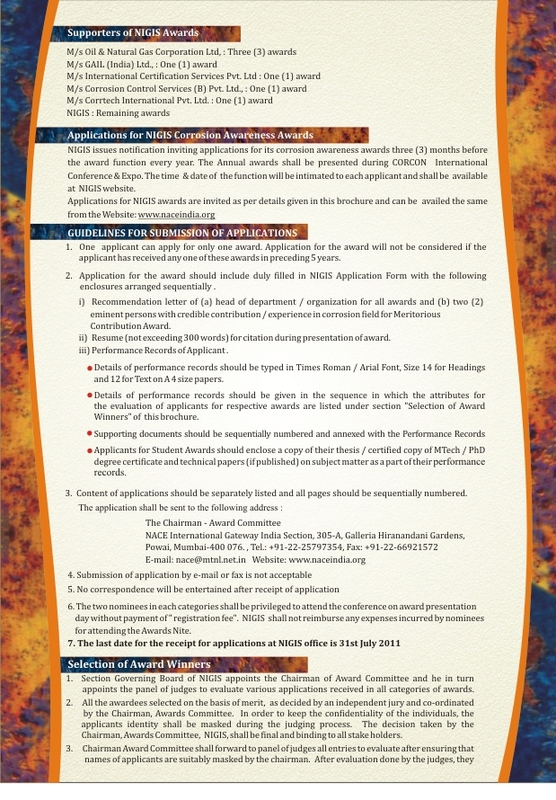 I will definetly contact you for the guidelines how to start my career as a fresher in corrosion field. The companies you suggested dont have current openings for fresher corrosion engineer. Last year there were 12 seats for MTech corrosion engineer in EIL. Manickam Valliappan • @Ishan: Thanks for posting this important discussion. As far the present opportunities are concerned, you can consider the following options. 1. Corrosion education - working with an academic institution. 2. Corrosion research and failure investigation - working with a private/government research institution/testing house. 3. Corrosion control service providers - CP, Chemical Treatment, Protective Coatings and Metallic/non metallic materials. 4. Corrosion consultant services - working with a freelancer or a plant design company/technical service provider. What is your main interest? We can explore the best option (I would say Combination: you may choose to begin your career with research first and then move to the industries or consultant houses or service providers; This combination determines the level of professional growth in our domain) based on the market trend and individual interests.. I recommend you to put your CV in Job column of this network. We will continue our discussion. India - Engineering College Alumni Networking - Do you feel that science and engineering education system in India supports and uses alumni networking to provide value education and research to entrants? Do you feel that science and engineering education system in India supports and uses alumni networking to provide value education and research to entrants? I attended my college (CIT, Coimbatore) alumni 1982-86 silver jubilee reunion. I felt proud of seeing 100+ alumni after 25 years during this function which was filled with fun and entertainment for family members. Our college education system is yet to open the doors for alumni networking to fetch value for science and technology development in India. There is a long way to go for #engineering and #technology filled #college #alumni networking for #innovation in #India. 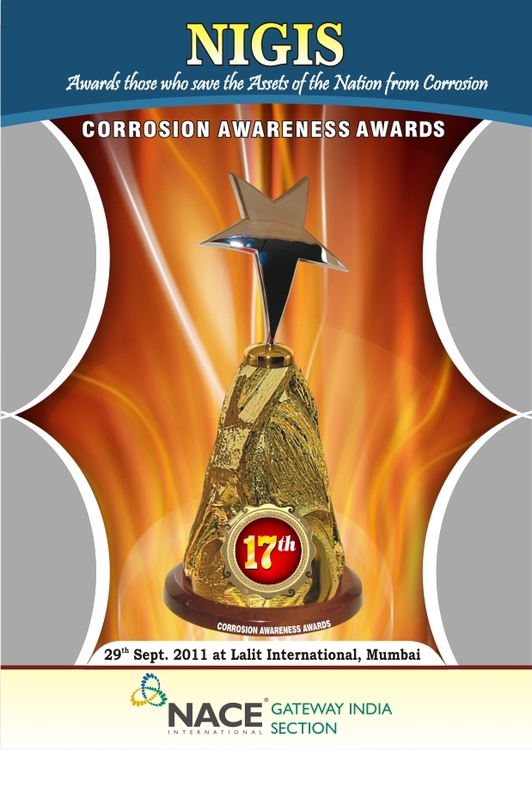 To commemorate Corrosion Awareness Day, NACE International Gateway India Section (NIGIS) will be presenting awards to individuals and institutions for their contributions to the awareness and developments in the fields of corrosion science and technology during “CORCON 2011” conference & expo on corrosion being held during 28th Sept – 1st Oct 2011 at Hotel Intercontinental -The Lalit, Mumbai. We solicit your participation in any of the eleven categories in which applications are adjudged for bestowing the awards. 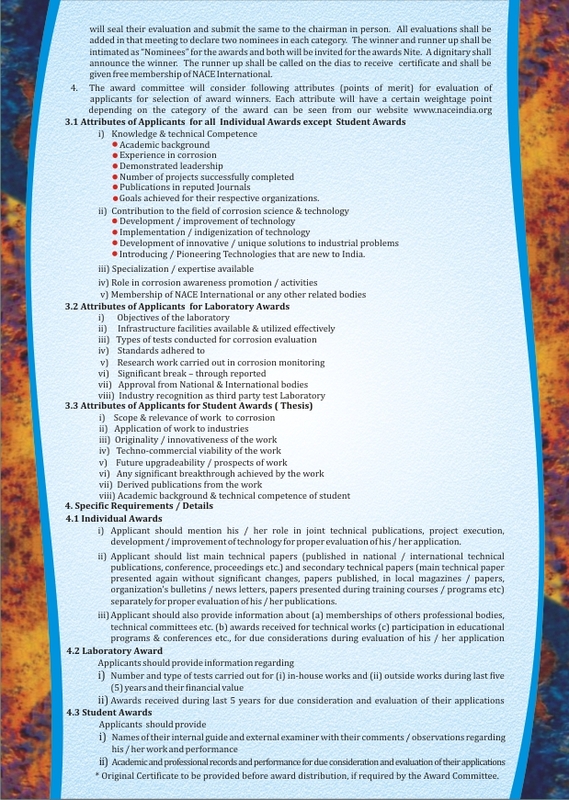 Details of all awards and guidelines / procedure for the submission of applications for various types of awards are given in the enclosed brochure - NIGIS Awards. Informing all concerned persons of your / other organizations regarding NIGIS Awards and inspiring them to submit their application for the award. V.A. Katkar, G. Gunasekaran, A.G. Rao, P.M. Koli, Effect of the reinforced boron carbide particulate content of AA6061 alloy on formation of the passive film in seawater, Corrosion Science, Volume 53, Issue 9, September 2011, Pages 2700-2712, ISSN 0010-938X, DOI: 10.1016/j.corsci.2011.04.023. The effect of boron carbide (B4C) reinforcement on the corrosion of AA6061 alloy was studied by investigating passive films formed in seawater. The higher passive current and its potential-dependence for these composites indicated formation of porous passive film. Electrochemical impedance spectroscopy (EIS) graph suggests that the alloy surface is partly or totally active. The formed passive film is n-type semiconductor junction in nature. The difference between corrosion potential (Ecorr) and potential at zero charge (PZC) suggests that the chloride ions responsible for film breakdown exist within the passive film. A suitable mechanism is proposed for the passive film breakdown. India loses a colossal figure of over Rs 2 lac crores every year due to the menace of corrosion. These expenses can be brought down to half if the good practices are followed to prevent and control corrosion. This offers a big opportunity to save cost and also enhance the life of products, plant & machinery, and civil structures. The Confederation of Indian Industry (CII) established a Corrosion Management Committee (CMC), which works to continuously create awareness and consciousness about the issue of corrosion in India, and promotes corrosion prevention strategies among industries and particularly SMEs. To give a spur to corrosion management culture in Indian Industry, Confederation of Indian Industry is organising 1st Global Corrosion Management Summit on 24-25 August 2011 at India Habitat Centre, New Delhi, India. The summit theme - Coatings & Linings would focus on addressing the most important issues related to maintenance, restoration of coatings,linings of older equipments & industrial plant. The summit will also introduce participants to new innovations in coatings and linings for new structures of various types of materials. In its continuing endeavour to provide opportunity to teaching faculty to upgrade their knowledge, the Petroleum Federation of India in its series of Industry Academia Interface programme organised a four-day residential workshop on Refining & Petrochemicals from March 16- 19, 2011 jointly with Lovraj Kumar Memorial Trust (LKMT) & Chennai Petroleum Corporation Ltd.(CPCL), Chennai. A study tour was also organized to the Tamilnadu Petroproducts Ltd.(TPL) and CPCL Refinery on March 19,2011. The 15 lectures delivered by industry experts were attended by 24 teaching faculty members from various Engineering Colleges / Universities in the states of Kerela, Andhra Pradesh,Tamil Nadu & Karnataka.There was no participation fee and they were provided complimentary boarding & lodging by CPCL. Focus on the following topics was made in this workshop. Corrosion Management seems to be deserted in this workshop. India - Standards - BIS: Will Corrosion lead to deleterious effect on the intended purpose: Security of Steel Flush Door Shutters? a) Dimensions and squareness test. Corrosion and related phenomena are nowhere included in this specification. Our Indian conditions are widespread and its effects on corrosion are evident in saline (coastal) and polluted industrial atmosphere. CECRI has recently updated Corrosion Map of India for atmospheric corrosion. The type of paint used shall be as specified in IS 1477(Part 2) or be of any other type as agreed to between the manufacturer and the purchaser. The colour shall be as agreed between the manufacturer and the purchaser. The purpose is not only the colour, it should be the life of shutter by providing a proper control measure. If the awareness is not there for corrosion among the manufacturer and the purchaser, the selection of control measure will be in question. @Members of our forum: your active participation in this discussion is solicited for sending our collective inputs to Bureau of Indian Standards. The Sixth International Conference on Aluminium – INCAL ’11 is being organized by the Aluminum Association of India (AAI) from 6 to 8 December 2011, at Hyderabad International Convention Centre, (HICC) Hyderabad, India. The Conference is supported by the primary integrated producers (Hindalco, Vedanta Group and the state owned Nalco) and secondary aluminium manufacturers ie., extruders, rolled product manufacturers, foil & can manufacturers, casting & forging industries, fabricators etc. Turkey: Biomaterials: Release of even small amounts of Cr, Al and V from the biomaterials 316L and Ti-6Al-4V may cause local irritation of the tissues surrounding the implant in the body environment and these ions mix into the blood stream. This situation may be prevented by applying suitable surface treatments to the biomaterials.The corrosion resistance of duplex treated samples was significantly improved in comparison with the uncoated and single treated samples. India: Corrosion Management: Look down: Rather than turning to people who have more experience, seek out junior people. The younger crowd often spots trends in technology long before even the best CIO knows of them (Source: Harvard Business). 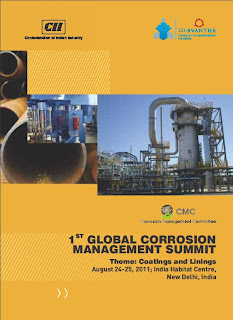 What is the postion with regard to corrosion management in India? Younger talent in our network is growing day by day. 1Department of Metallurgical and Materials Engineering, Indian Institute of Technology, Kharagpur, India. 2Department of Metallurgical and Materials Engineering, Indian Institute of Technology, Kharagpur, India. Present address: Indian Institute of Technology, Bhubaneswar, India. Addition of boron to the TNZT alloy shifts the Ecorr value toward a more active direction and increases the icorr as well as ipass values significantly, and therefore deteriorates the corrosion resistance of the titanium alloys. In general, duplex aged TNZT samples show better corrosion resistance than other heat-treated TNZT or TNZTB samples. Most of the water supply lines can be seen passing through dirty water accumulated in the choked drains. In some places, where the pipelines have cracked due to age or corrosion, dirty water percolates in and is supplied to the consumers. Executive engineer of the urban water supply authority of Gondia J P Bhutange and deputy engineer V V Bannore said the problem has become so chronic that in spite of their best efforts, they were no able to trace the holes and they have to cut the pieces of the pipelines block by block and locate the fault. Out of the 3,350 million litres of water that is supplied to the Mumbai city everyday, nearly 700 million litres is unaccounted for, which means it is either lost to leakages or is stolen. GURGAON, India -- Production from the offshore Ravva field in Indian block PKGM-1 averaged 36,942 boe/d during the 2010-11 year, according to operator Cairn India. The field completed its 16th year in service, and has yielded more than 232 MMbbl of crude and 278 bcf of gas to date, more than double initial expectations, Cairn claims. LONDON – Reliance Industries has discovered more gas in India’s deepwater Krishna Godavari (KG) basin. According to partner Hardy Oil & Gas, the commerciality of the find, dubbed Dhirubhai – 54, remains under review. However, it expects the play fairway cover a large area within the block. The well, KG-D9-A2, was drilled in 2,700 m (8,858 ft) water depth in the D9 license, and to a TD of 4,881 m (16,013 ft). A new material cannot be employed in a design unless the engineer has access to reliable material properties and, hopefully, costs. This illustrates one reason why the tried and true materials are used repeatedly for designs even though better designs could be achieved with newer materials. At the start of the design process, low-precision but all inclusive data are needed. At the end of the design process, data are needed for only a single material, but they must be accurate and very detailed. Information comes through various channels: Handbooks, International/National/Company Standards and Specifications, Research Reports, Technical Publications, Market Survey Reports, Materials Databases, Expert Systems, and Process Specific Research Studies. Internet based systems play a crucial role in assisting the designers and material selection personnel to fetch the proven experience of materials considered for similar process situations elsewhere in the world. The modern day social and technology networking systems facilitate the researchers, material suppliers, designers, consultants and industries personnel to exchange their views on selection and find appropriateness of selected materials. “We CAN Control Corrosion in India” is an example networking group. This group establishes global level multi-dimensional communication pathways (Technology Providers-Technology Users-Academic and Research Institutions-Professional Associations-Legislation Support) and guides professionals from various disciplines and other technology groups to network with the best material selection knowledge source for corrosion management (Source: http://corrosionmanagementsurvey.in/). 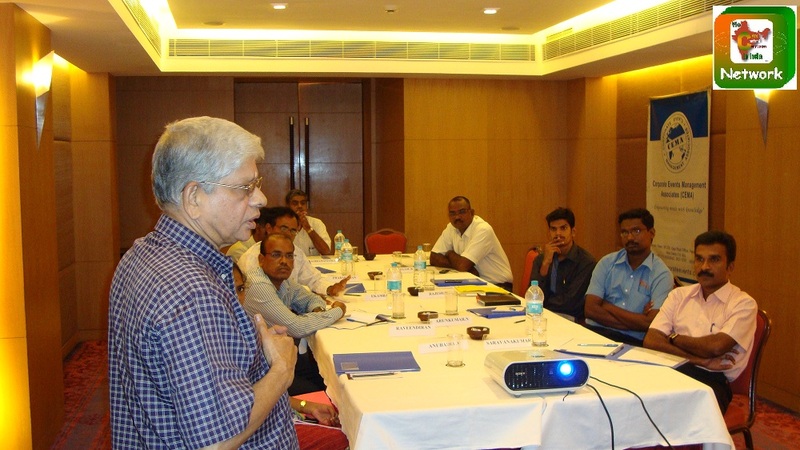 Snapshots of our Corrosion Management Workshop in Chennai. 8 participants (3 from Automobile; 3 from Pharmaceutical; 1 from Engineering Industry; 1 from Corrosion Control Service Provider) attended this workshop. It is great to see the awareness for corrosion in these sectors. We are now in the process of bridging these participants with our networking group. Do you feel that e-learning of Corrosion Science and Engineering course is essential similar to the one announced for Environmental Science by the Department of Higher Education in India? Now colleges will have to teach the subject of environment science through e-learning. Since the University Grants Commission has not created any new posts for the teachers of environment science, many colleges do not have enough teachers to teach this compulsory subject. To solve this problem, the higher education department issued a government resolution on June 7, advising colleges to teach environment science by using ‘e-learning facility’ provided by a service provider selected and approved by the UGC so that the students do not suffer. The department has appointed a service provider which will provide study material to all the colleges. The study material has been approved by the UGC. This service provider will hold workshops in all colleges to teach the students on how to use the study material. The e-learning material consists not just of theory but includes 50 to 60 projects for the students to work on and it also teaches them how to do it. The course material also consists of a few CDs that can be viewed on any computer. Worldwide surveys show that a nation's GDP is significantly affected by corrosion losses. This problem is not only the buzzword for people in Process Industries, but also perennial in public utilities such as metro water supply. "We CAN Control Corrosion in India", an Open Source Knowledge Management networking group is bringing the collaborative efforts of various agencies and individuals to resolve corrosion management challenges in India. 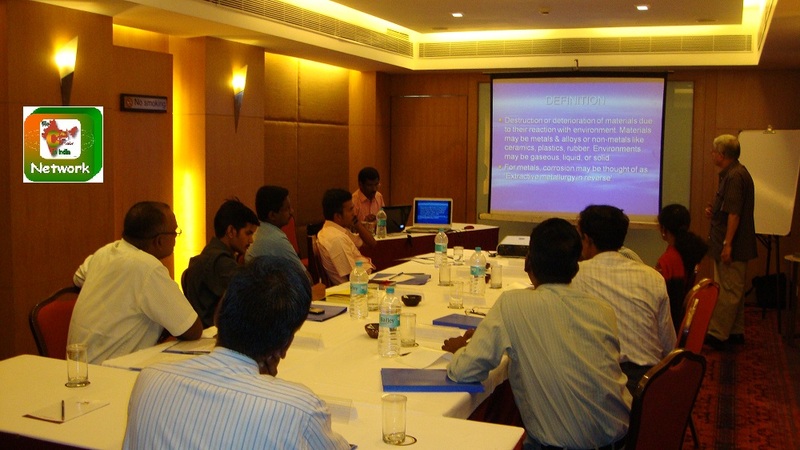 Our network interacts with Corporate Event Management Associates (CEMA) to organise 2 day Workshop on Corrosion Management, 14-15 June 2011, Chennai, India. Manager Marketing, Corporate Events Management Associates, Satyam Tower, SF 276, Paschim Vihar, New Delhi - 110063. Please visit the following links to have more information on the program. Good and bad bridges in Karnataka are in the ratio of 50:50 and most of the RCC bridges constructed now do not last long due to corrosion or overloading, said Dr C. S. Viswanatha, Chairman, Civil-Aid Techno Clinic, Bangalore. Do you feel that the Integrity Assurance initiatives taken by the Public Sector Companies in India support using the national resources for corrosion control in India? Qualification Requirements for DA Engineer in Page 12: He shall be either a Professional Member of the Institute of Corrosion (UK) or a NACE International (USA) Certificated Corrosion specialist. Do you feel that this kind of prescription will limit the opportunities for participation to certain sections? Is there a good number of certified people available with service companies in India to carry out this job announced by a public sector? Visit http://bit.ly/jLQxDc to have more information on the EOI. ENGINEERS routinely inspect bridges and other structures for cracks and corrosion. But because they can’t always be there in person, one highly intelligent bridge knows what to do when trouble arises: send them an e-mail. The Jindo Bridge network has 663 wireless sensors, each providing a channel of information at an installation cost of about $100, far less than the thousands of dollars typically needed to install each wired channel, said Dr. B.F. Spencer Jr., a professor of civil and environmental engineering at the University of Illinois at Urbana-Champaign. Dr. Spencer directs the American-based arm of the bridge project, which also includes the University of Tokyo and the Korean Advanced Institute of Science and Technology. Batteries on the bridge network are expected to last about three years before they need replacement. Integrated platform for interfacing Corrosion Management with Risk Based Inspection. This report reflects the current situation of selected national regulators’ reference and use of national, regional, international and industry standards in their regulatory documents, with a particular focus on standards for materials, equipment, systems and structures for the offshore petroleum industry. This report attempts to analyze the documents prepared by national and provincial lawmakers and the regulators themselves. Oil Industry Safety Directorate (OISD) is a technical directorate under the Ministry of Petroleum and Natural Gas that formulates and coordinates the implementation of a series of self regulatory measures aimed at enhancing the safety in the oil & gas industry in India. Excerpts from our technical paper on "India’s Offshore Integrity – Learn and Use Global Offshore Experience" published in Offshore World, 2010 http://corrosionmanagementsurvey.in/our-publications/: Lord Cullen, commissioned by the Department of Energy, UK to investigate the accident of Piper Alpha, recommends that hazards should be assessed from the earliest stages of design in the same way the nuclear industry does. The new safety directorate for offshore installation in the HSE may draw on the expertise of the nuclear industry (Source: The Public Inquiry into the Piper Alpha Disaster, Cullen, The Honourable Lord, HM Stationery Office, 1990). Note on Piper Alpha: It was a North Sea oil production platform. This platform began production in 1976, first as an oil platform and then later converted to gas production. An explosion and resulting fire destroyed it on July 6, 1988, killing 167 men, with only 59 survivors. It is recognised that there are many ways to organise and operate successful corrosion management systems, each of which is asset specific depending on factors such as Design, Stage in life cycle, Process conditions and Operational history. All the standards and regulations put forward by various agencies across the world are the outcome of joint efforts of Government-Asset Owners-Technology Providers-Safety Agencies-Inspection Authorities-Academia-Research Institutions. Our country is yet to develop programs like Joint Industry Projects (JIPs) to address the materials and corrosion concerns with specific reference to our Indian operating conditions. Experience gathered from outside sources could be taken as valuable guidelines to enumerate the importance of such studies and initiate JIPs. A school of thought continues to live with our Indian industries that Research community, especially the government owned scientific and industrial research laboratories, do not effectively utilize the research and technical capabilities to deal with the real world conditions. It is good to know that CII Corrosion Management Committee is headed by Dr Baldev Raj, a leading expert in the Indian nuclear industry. There is a greater dependency on a variety of resources. Knowledge Transfer from Indian Diaspora in this domain can help the national efforts in a great way. National agencies/research institutions should keep their policies open for receiving such collaborative efforts and encouraging the Indian Diaspora to show interest in the development of a national policy for Corrosion Management. Visit the Iron Pillar Dashboard on http://corrosionmanagementsurvey.in/iron-pillar-dashboard/ to see the survey response. New Delhi: The government should introduce financial support through legislation for preventing corrosion of machines, pipelines and industrial structures as companies lose a whopping Rs 2 lakh crore annually due to such damages, CII on Sunday said. The chamber has asked the industry and government "to collaborate to introduce the Corrosion Act in India, like US, which provides incentives to organisations for taking preventive measures against corrosion". New Delhi: The government should introduce financial support through legislation for preventing corrosion of machines, pipelines and industrial structures as companies lose a whopping Rs 2 lakh crore annually due to such damages, CII on Sunday said. The chamber has asked the industry and government "to collaborate to introduce the Corrosion Act in India, like US, which provides incentives to organisations for taking preventive measures against corrosion". The World Corrosion Organization designated April 24, 2010 as the inaugural Corrosion Awareness Day. Corrosion Awareness Day is designed to highlight the estimated $2.2 trillion annual cost of corrosion worldwide (3 to 4 % of GDP of industrialized countries) reflecting in part many decision-makers in industry and government not fully understanding the consequences of corrosion and how critical it is to control it.